Indian food is incomplete without desserts. We( at least most of us) just keep finding an excuse to eat sweets. 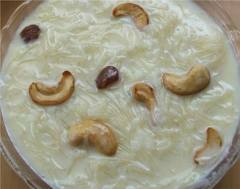 One of the quick, easiest and tasty desserts is sevaiyan ka kheer. Also known as shavige payasa (ಶಾವಗೆ ಪಾಯಸ) in Kannada or Payasam in South India. Posting a recipe here. Heat the ghee in a heavy bottomed non-stick pan over medium heat. Add sevaiyan and fry till golden brown. Pour milk and add sugar while stirring continuously and bring it to boil. Cook for about 15-20 minutes or until the milk is slightly thickened. This dish can be made with a variety of ingredients in a variety of ways. I have posted the sevaiyan one coz that is what we frequently prepare at home. Oh that sounds delicious – a bit like a sweet rice or tapioca pudding! Wow!! 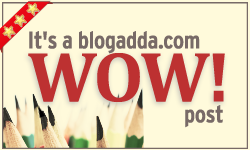 I could cover all your blog, no post is missed, but intentionally left a few without commenting. So, totally, you owe me three ice-creams or ONE KHEER! Hahahaha…. Could not stop myself from clicking as soon as I saw the photo of kheer! !…I always like my payasam warm! Ah nice! where do you stay btw? I love kheer from our local Indian restaurant! Yummy my favorite sweet too and I look forward to my nani’s house as she makes the best kheer ever. In those old traditional slow cooker …..
K for Kya baat hai ..